Hemp jewelry is groovy and fashionable, simple to learn, and the materials are pretty affordable, even for starving students. You can tote your work around with you, and talk about speedy! You can often create something from start to finish in less than an hour! All you need for is hemp twine, maybe some glass, ceramic, or wooden beads with large holes, two hands, and you're golden! 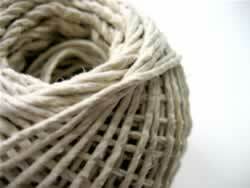 Hemp twine is available in balls and sometimes small colored skeins in any craft store. 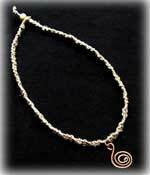 Go to this page for more about buying twine, sizing and other materials you can use for knotted jewelry. I have info about what beads to use, and some cool alternatives to beads that you may not have thought of on this page too. The most common hemp jewelry uses simple macrame knotting techniques. Totally new to knotting? This glossary page explains some common hemp jewelry making terms. Visit this page to learn the lingo. Go to the hemp finishing techniques page to learn how to create my favorite hemp clasps and closures. Live Action Knotting on a Road Trip! This video shows the Threadbanger chickie making a hemp bracelet using the lark's head knot and the half knot.